Octavio Eduardo Dotel was born on November 25, 1973 at Santo Domingo. 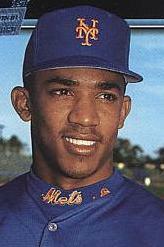 He was signed as an amateur free agent by The New York Mets in 1993, playing at their Dominican affiliate for two years. He developed in the Mets minor leagues going 11-3 in at A ball in 1996, advancing up to AA & AAA going 12-8 posting a 2.84 ERA in 1998. In 1999 he was 5-2 at Norfolk when he got called up at the end of June making his debut against the Braves in Atlanta taking a loss. He got shelled for six runs, then five more runs in his next outing although he earned a victory in Florida against the Marlins. He settled in nicely, going into the seventh inning or beyond in his next three starts not allowing more than one earned run each time. He didn’t earn another loss until the middle of September, by that time he was 7-1 although his ERA was at 4.86. He would move into the bullpen for the rest of the year finishing up at 8-3 with 85 strikeouts in 86 innings, but he had allowed 12 long balls & a posted a 5.86 ERA. Post Season: In the NLDS he pitched in Game #2 but allowed two runs in 1/3 of an inning in the 7-1 Mets loss. He was the winning pitcher in Game #5 of the NLCS when Robin Ventura hit his famous grand slam single. Dotel pitched three innings from the 13th inning on allowing one run on Keith Lockhart’s triple. That December he was traded to the Houston Astros along with Roger Cedeno in exchange for Mike Hampton & Derek Bell. Hampton was a big part of the Mets 2000 pennant season. In Houston, Dotel saved 16 games striking out 142 batters in 125 innings while posting an ERA of 5.40. Billy Wagner took over the closing role the next year & Dotel became his set up man. In the next three years he posted winning record with ERA’s under three each season. 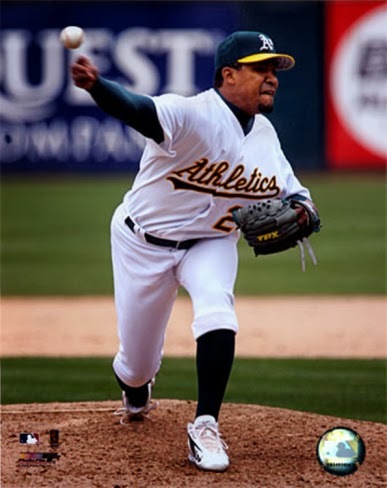 In June of 2004 he was part of a three team trade, that sent himself & Carlos Beltran to Oakland. There he would save 22 games the rest of the season, but lost his job the next year when he needed Tommy John surgery & Huston Street arrived. 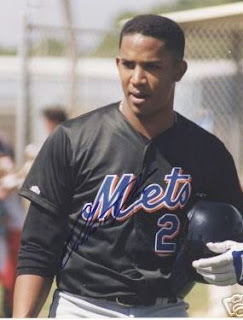 Dotel would go on to pitch for the AL New York team (2006) the Kansas City Royals (2007) Atlanta Braves (2007) & the Chicago White Sox (2008 / 2009). He then moved on to the Pittsburgh Pirates in 2010. There he would save 21 games for the Pirates through July 31st, making 41 appearances with a 4.28 ERA. He was then traded to the Los Angeles Dodgers at the trade deadline, then to the Colorado Rockies where he finished the year. In January 2011 he signed as a free agent with the Toronto Blue Jays. After starting out going 2-1 in 36 games, then on July 27th he was traded to the St. Louis Cardinals along with Edwin Jackson, Corey Patterson & Marc Rzepczynski in exchange for Trever Miller, Colby Rasmus, Brian Tallet and P.J. The trade was one of the pieces that tightened up a bullpen that got the Cardinals to the World Series. In 29 games with the Cards he went 3-3 with two saves posting a 3.28 ERA getting credit or five holds. Post Season: In the 2011 NLDS he got the win against the Philadelphia Phillies in Game #2 evening up the series. In three games he pitched 2.2 scoreless innings. In the NLCS against the Milwaukee Brewers he pitched four scoreless innings earning the victory in Game #4. In the 2011 World Series he appeared in five games, taking a loss in Game #5. In 2012 he signed on with the Detroit Tigers getting himself to yet another World Series. He was 5-3 with eleven holds and one save in 57 appearances. 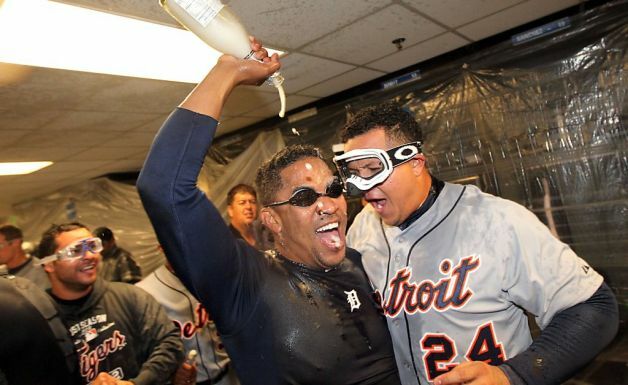 He made two appearances in the ALDS, ALCS & World Series pitching 4.2 scoreless innings. In 2013 he pitched just six games with the Tigers watching his ERA balloon to 13.54 & he finished the year in the minor leagues. 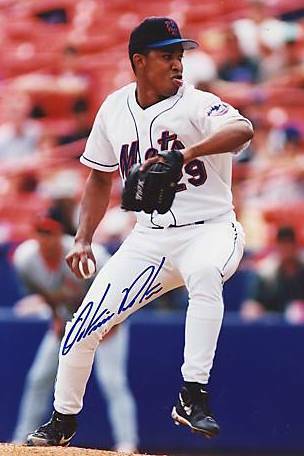 After a 15 year career Dotel, was 59-50 with 109 saves, 1143 strikeouts & 412 walks in 951 innings pitched, while posting a 3.78 ERA in 758 appearances. He ranks 103rd all time in games finished.